The Cincinnati Reds have too many corner outfielders at the Major League level than they have spots available to play them. Heading into the 2018 season they have Adam Duvall, Scott Schebler, and Jesse Winker seemingly lined up for two spots. Duvall has been an All-Star, but has had problems carrying his first half performance into the second half in his two seasons. Schebler hasn’t been able to put together a full season just yet – in 2017 being crushed by a terrible month of July when he tried playing through an injury. And Winker has only had 137 plate appearances in the big leagues. There are still plenty of questions as to how the left and right field positions will play out as the organization moves forward. In Triple-A during 2017 it was mostly Jesse Winker, Sebastian Elizalde, and Phillip Ervin who saw most of the action. As mentioned above, it seems that Jesse Winker is going to be in the big leagues for 2018, and for that he can thank his 2017 performance. With the Bats he hit .314/.395/.408 in 85 games played. The power didn’t quite come through, hitting just two home runs. But, in 47 games played with the Reds he hit .298/.375/.529 with seven home runs. How much power he will hit for in the Major Leagues will determine just how valuable he can be. 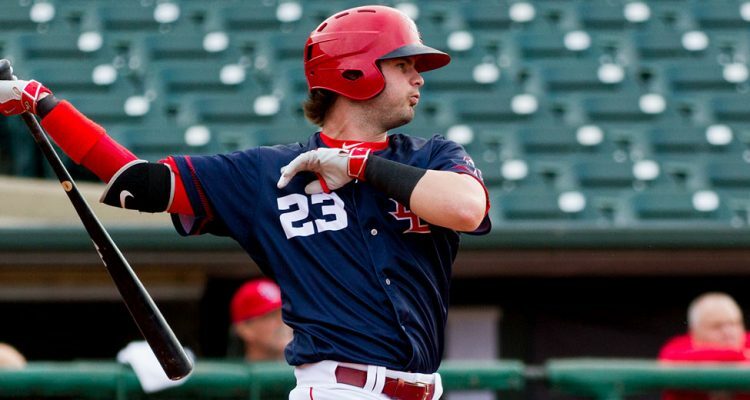 With a good hit tool and a strong plate approach, the power is the one thing that’s been lacking the last few seasons for Winker. Phillip Ervin, like Winker, saw time in both Louisville and in Cincinnati. Also like Winker, he hit better in the Major Leagues than he did with the Bats. In 99 Triple-A games he hit .256/.328/.380 with 23 steals and seven home runs. In 28 games with the Reds Ervin hit .259/.317/.448 with three home runs and four more steals. Unlike Winker, Ervin can handle some center field, which gives him a bit better defensive value. His bat will need to improve, particularly in the batting average area, if he’s going to compete as a starter for a corner spot. Otherwise, he looks like a strong 4th outfield option who you can use everywhere and in multiple facets. Sebastian Elizalde did not see any time in the Major Leagues in 2017. His entire season was spent with the Bats. in 134 games he hit .277/.329/.377 with 15 doubles, six triples and eight home runs. He only struck out 70 times in 559 plate appearances, walking 35 times along the way. Elizalde has seemingly sacrificed some power shown in the past for a more controlled swing and big improvements in contact rate over the last two seasons. With his skillset, he seems more suited for a bench role than a starting role. Limited power and being unable to play in center makes it tough to envision an ideal spot on the bench. But, if a team is looking for a contact hitter with a little bit of pop then he could potentially fill that kind of role. In Double-A Pensacola there were four guys who split up a majority of the time in the outfield. Tyler Goeddel and Aristides Aquino spent most of their time in the corners. Gabby Guerrero and Brian O’Grady saw the most action in center field. Another guy in the mix at this level, though he only saw limited action due to injury, is Nick Longhi. Aristides Aquino had a down year, especially by comparison to his 2016 campaign. He struggled at the plate, hitting just .216/.282/.397. The power was there as he hit 17 home runs on the year, but he struggled to show much of an average or get on base thanks to just 39 walks and 145 strikeouts in 131 games played. To get the most from his bat he’s going to need to cut down on the strikeouts and find a way to walk more frequently. Defensively, he’s a corner guy who shows off a good arm, but is mostly just an average defender. Tyler Goeddel split his time between Pensacola and Louisville, playing all three defensive spots. Between the two stops he hit .259/.360/.378. He did that with 52 walks and 84 strikeouts in 470 plate appearances. He also stole 16 bases in 21 attempts. Technically he’s not a prospect thanks to spending the 2016 season with the Phillies as a Rule 5 draft pick, but I’m counting him as a part of the farm here. His best chance is to make the roster as a utility player who can play just about everywhere (he’s got some experience on the dirt as well as time in the outfield). 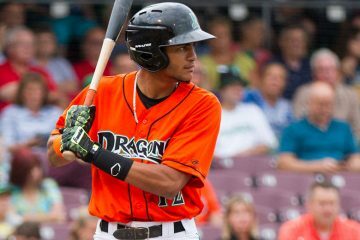 Center field saw Gabby Guerrero start over 80 games, but he also saw time in the corners. It’s the corners where he’ll play in the Major Leagues. Offensively he hit just .273/.320/.379 for the Blue Wahoos. He struggled to hit for any power in the first half, going without a single home run. In the second half he would hit seven and slug .418 (.341 in the first half). There’s more power to tap into for Guerrero, and he’ll have to do that if he’s going to get the most from his bat. Brian O’Grady split his time between Pensacola and Daytona, with a majority of it coming in Pensacola. Things didn’t quite go as planned for O’Grady at the plate. A .198 BABIP did his line in, as he hit just .166/.308/.337. He showed off some pop and a little bit of speed. He also drew plenty of walks. Strikeouts were a problem, though, as he racked up 59 of them in just 210 plate appearances with the Blue Wahoos. If he can cut down on the strikeouts and raise his average, his outfield versatility could give him a shot as a 4th or 5th outfielder. Nick Longhi didn’t spend much time on the field for the Reds in 2017. Cincinnati acquired him on July 2nd in a trade from the Red Sox and less than two weeks later he hit the disabled list for the rest of the year after tearing his UCL and requiring Tommy John surgery. Between his two stops, both in Double-A, the 21-year-old (now 22) hit .266/.314/.410 over 69 games played. The Red Sox had him playing first base in 2017 but he projects as a corner outfielder and the Reds slid him there for the short amount of time he was around. Currently his contact rate is what sticks out for him offensively. There’s some power in his game, but in order to get more of it out he will need to increase his fly ball rate significantly. Time is on his side, as he’ll be 22-years-old for almost the entirety of his 2018 season. 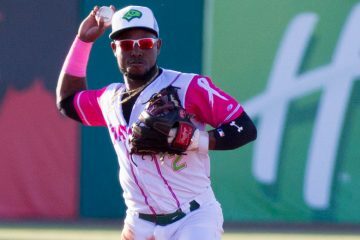 For the Daytona Tortugas the corners were manned by Daniel Sweet, Reydel Medina, and early in the season, Narciso Crook. Sweet will be looked at with the center fielders next week, leaving us with just two guys to look into from this level. Reydel Medina spent nearly the full season in Daytona, seeing just 10 games in Double-A Pensacola. With the Tortugas he struggled at the plate, hitting .236/.284/.397 with 20 walks and 123 strikeouts in 112 games. There’s real power in his bat, but his struggles with pitch recognition is holding his overall offensive profile back. Narciso Crook missed most of the 2016 season with an injury. The same thing happened in 2017. The outfielder last played on May 18th for the Tortugas. In 36 games he hit just .213/.275/.360. He’ll be 22-years-old in 2018, so there’s still plenty of time, but he’s lost nearly two years of development time due to injuries. There’s a good set of tools with Crook, who can probably handle center field – especially in a backup role, but he will need to start showing a little more offensively moving forward. In Dayton there were two main outfielders for the majority of the season. Taylor Trammell played in 104 games in left field, but he will be viewed as a center fielder next week. The other corner outfielder in Dayton was Michael Beltre, who played 95 games in right field. He got out to a quick start in 2017, but struggled as the season went along. Beltre posted a .238/.323/.324 line in 117 games. He showed solid plate discipline during the year, but was unable to translate that into hits. There are lots of tools to like for Beltre, who can run, makes some contact, gets on base, and has some real untapped power potential. But, he’ll turn 23 in July, so he’s going to need to start getting more from his impressive tools in order to get into the conversation as he moves up the ladder. Billings saw a plethora of outfielders, but the three main guys all will be viewed as center fielders in the article next week. The same thing can be said for the players who were in Goodyear for the Arizona League Reds. There are certainly some toolsy players among this corner outfield group. What it is lacking, particularly beyond the Triple-A group, is production. 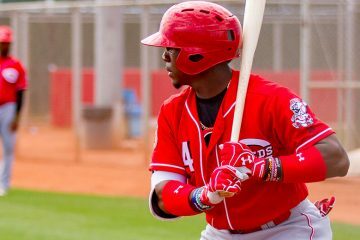 Jesse Winker, Phillip Ervin, and Aristides Aquino are all Top 25 prospects from the corner outfield collection, with the first two being ready to contribute in the Major Leagues right now in one capacity or another. It’s the guys below them on the totem pole that have a lot of questions that need answered as things move forward. There are three Top 25 prospects in this group, though I feel like Phillip Ervin should only partially count. While it doesn’t seem that the Reds believe he can handle center, I’m not as sure about it as they are. With two guys Major League ready, that provides plenty of value, and there’s plenty of upside from the remaining guys – but their lack of production hurts. Overall I’ll give the position a B- on the backs of Winker and Ervin. I really like Longhi. He’s probably my favorite of this group outside of the guys who will likely start the year in the MLB. He makes good, consistent contact, and I think he actually has some untapped power potential. Nabbing him was a great use of the otherwise unusable international bonus money last year. That a pretty low score considering that is the strongest position in our major and minors. We almost have an unlimited amount of talent to plug in at either left or right. Granted no Jay Bruce but we probably have a future all star in Winker. I still believe Ervin is under valued and would actually make for a better overall player than Hamilton if he was our everyday CF. Schebler and Duvall combined to hit how many dingers in 2017 and that is still considered a B- even with Winker and Ervin backing them up for 2018? I would think their value would be more or less a B + or A – based upon previous results and the upstarts chewing at their heels. B+ or A- needs either a ton of depth, or an elite prospect and good depth. This position has neither. Since Longhi is not a pitcher, will his recovery time be quicker? When would he expect to begin baseball activities ? Yes. He should be ready to go 100% for spring training. Cozart had TJS in August the year he had it and was ready for spring training. Odds are Longhi will be as well. Is Longhi his non throwing elbow like Cozart? It was his throwing elbow. I wouldn’t mind seeing a college bat separate themselves much in the way Benintendi did a few years back. Maybe someone that profiles as a RF so they don’t go top 4 Jenista, Conine, and Swaggerty are some of the names getting early draft hype as 1st rounders that could climb up the board with a dominant year. not that he would make it into the top 10, but Trevor Larch at Oregon State (preseason draft #40 by one service) did homer in his first 3 games in Arizona and is tearing the cover off of the ball. the last guy to do that for the Beavers was named Conforto. All Minor leaguers are not there yet. Think pitchers and catchers report Feb. 28. Starting pitchers and catchers report on February 28. Relievers and position players come in together. I think B- is fair. Maybe generous. 1 player in the top 15 prospects. CF has 5 of the top 15 so am looking forward to that grade I think A-. I guess 3B is stronger because of Senzel but a year from now I see Trammell and Siri as top 50 prospects and that becomes a dominate position. I agree with Duke in that a college OF bat would be nice at #5 in the draft. I really, really like Tyler Goeddel as a sleeper this year to break out. He’s got a very good bat. I see no mention of Randy Ventura a guy with a lot of speed acquired at midseason 2017. He can compete with almost anyone in organization except Billy speed wise. I would see him as a left fielder. For now he’s going to be included with the center field options.